The 37-year-old Fisher said in a letter to Predators fans that "I know I've made the right one." Fisher was chosen the Predators' captain in September 2016. He had 18 goals and 24 assists last season as Nashville earned its first Western Conference title. He's also husband to country star Carrie Underwood, and they have a son together. "I approached this season with the mindset that it could be my last, and now that it's past, I'm looking forward to a future that includes a lot more time with my family," Fisher wrote. "Things change when you have kids and you have a family. They've supported me without question, and now it's my turn to return the favour." The Tennessean first reported Fisher's retirement. Fisher's last game was Game 6 of the Stanley Cup Finals, a 2-0 loss to Pittsburgh. Fisher noted the Predators saw on TV before the game the crowd of fans in Nashville and the run the franchise made to the Stanley Cup. "Knowing we were so close to winning it all in June only makes it more difficult to leave it behind, but I do so with hope. Endings are always tough, but I believe when something ends, there are new beginnings, new opportunities and new things to be excited for, too," Fisher wrote. "Your leadership and friendship allowed our team to bring an entire city together in our quest for the Stanley Cup... and that will always be one of the greatest memories of my life," Neal said. "Congratulations on an incredible career, but the greatest mark on your resume is the Man you are one of the best examples of hard work, integrity, humility and class. We'll all miss you!!! The Predators had wanted Fisher back. While waiting for the captain's decision, general manager David Poile made sure to protect the roster by signing centre Nick Bonino away from the Penguins . Poile also signed forward Scott Hartnell for veteran leadership. Now Nashville will have to pick a new captain for a second straight year. 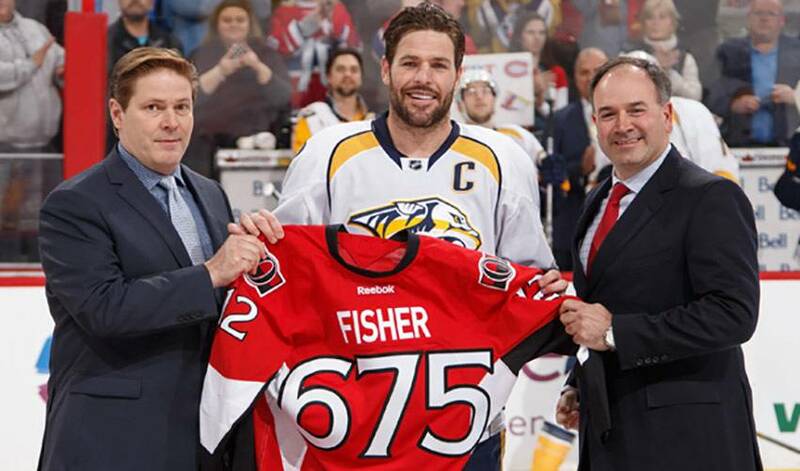 Fisher was named the seventh captain in team history last summer after the Predators traded defenceman Shea Weber to Montreal for defenceman P.K. Subban . Defenceman Roman Josi, who will be going into his seventh season with the franchise, is a top candidate.